The annual trip to the sunshine state of Florida is underway as karters from around the country are preparing for the World Karting Association Daytona KartWeek. Three unique events are set to take place at the World Center of Racing – the Daytona International Speedway. The WKA Dirt World Championships and the WKA Dunlop/Xeramic National Road Racing Series Daytona Championships will be joined by the WKA Margay Sprint Nationals. Dirt racers will be competing around the 4/10-mile oval that is situated outside the NASCAR 1-2 turns. Road racers have been traveling to Daytona for over 40 years, set to hit the high banks and inner roads of the 3.5-mile sports car course for three days. The Manufacturers Cup Series and Winter Cup competitors will take on the 7/10-mile kart course inside NASCAR 3-4 of the DIS facility. eKartingNews.com will have complete coverage Margay Sprint Nationals, beginning practice day on Wednesday, December 28. A full day of practice is schedule to take part, with EKN bringing you stories from around the event in the Paddock Insider. EKN Live is scheduled to begin Thursday, December 29 when racing begins. Each day features qualifying, Prefinal, and Final action, live at www.ekartingnews.com/live. Updates are to be posted on the EKN Official Discussion in the Forums section, along with Facebook, Twitter and Instagram. The coverage throughout Daytona KartWeek is focused primarily around the Margay Sprint Nationals, with updates from the Dirt and Road Racing to be published to the Forum and Social Media accounts. Over 200 entries have pre-entered for the 2017 Manufacturers Cup Series and Winter Cup openers over nine categories set to compete. This year’s event format has been adjusted to provide optimal track time and focused on the ability to complete the racing before the sun sets over the west high banks of the DIS oval. A qualifying, Prefinal, Final structure will be utilized at this year’s Daytona KartWeek instead of the qualifying, two heats and Final format. With the pre-entry numbers up, it is expected to surpass the 256-mark set a year ago. Last year, the Pro IAME Senior category featured 47 drivers battling within the high banks of the Daytona International Speedway. 2016 is shaping up to be another stellar battle, with half of that already pre-entered, including the top-seven from the 2016 championship standings. Newly-crowned champion Braden Eves (Kosmic) is set to begin his title defense at Daytona KartWeek, not yet a winner at that event. 2016 EKN Driver Rankings #1 driver Brandon Lemke (Merlin) will be fighting for his first Daytona KartWeek victory in the Senior class as well. The Franklin Motorsports pilot came close last year, placing just behind Day 2 winner Brandon Jarsocrak. Daytona was the only victory toward the 2016 season for the KartSport North America / Praga pilot, looking to defend the win and stand on top of the podium before the 2016 calendar turns over. Former WKA champion Alexander Kardashian (Top Kart), two-time winner in 2016 Jacob Donald (FA Kart), Top Kart pilots Jonathan Kotyk and Abby McLaughlin are among those top title contenders from 2016 looking to get things started right in 2017 at Daytona. Other notable names include SKUSA SuperNationals S1 podium finisher AJ Myers (TB Kart) – who won at Daytona KartWeek 2014 in Stock Moto – Austin McCusker (FA Kart) and Ryan Raffa (PCR). Eves added his name to the list of multiple championships in the same season under the WKA Manufacturers Cup Series program, also scoring the most points in the Yamaha Senior division. Eves (Kosmic) will pull double duty once again, entering Daytona as one of the favorites in both. Dakota Pesek (Top Kart) is the USPKS champion from 2016, and finished vice-champion to Eves this past season in WKA competition. The two combined for five of the last six wins to close out 2016. The Hurlbert sisters – Emily (OTK) and Kindra (Ricciardo) – are among the top contenders along with Merlin driver Jake Venberg. Numbers have nearly doubled for the Pro IAME Junior division, featuring 32 drivers already pre-entered. A number of returning drivers along with a large amount of graduating Cadet drivers set to make their Junior debuts in Daytona make up the entry list. Among them is 2016 class champion Pauly Massimino (Top Kart), a rookie last season that used consistency to claim the title. Massimino went winless in the category, looking for his first victory with the start of 2017. Only one winner from the 2016 season is entered in the field – Tyler Gonzalez (Tony Kart). A driver under the new Speed Concepts Racing program, Gonzalez swept the season finale at New Castle and is among the favorites entering Daytona. 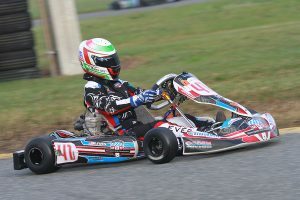 Another to watch is SKUSA SummerNationals double winner Dylan Tavella (Tony Kart), making a return to WKA competition. A number of Cadets are making their Junior debut in Daytona, including SKUSA champion Tyler Maxson (Tony Kart), Kaden Wharff (Top Kart), Caleb Bacon (OTK), Devin Gomez (FA Kart), and KartSport Noarth America’s Zane Maloney (OTK). Defending Yamaha Junior champion Pauly Massimino is not scheduled to defend his crown in 2017, opening the door for a new driver to finish on top this upcoming season. The top returning drivers include Round 8 winner Tyler Ferris (Top Kart), Spike Kohlbecker (Margay) and Arie Venberg (Merlin). A few of the Cadet graduates are set to compete in the Yamaha division, with many of them looking at just the IAME class. A number of the top Cadet drivers have moved up the ranks to the Junior divisions, including in the Pro Swift Sportsman category. Luca Mars scored the championship in 2016, however, will not be focusing on defending the title. Thus, it opens the door for a number of competitors. Among the favorites are the Adams brothers – Garrett and Logan. The Comet Kart Sales / FA Kart drivers focused on Yamaha competition in 2016, primed to do double duty in 2017. The top two from the Mini Swift 2016 standings are moving up. Champion Jeremy Fletcher (Tony Kart) and Eli Trull are ones to watch throughout the year. With the top two from Mini Swift in 2016 moving up, that has left a void for the rest of the field to fill in. Among the early contenders include the rest of the top-five in the standings. Caleb Gafrarar (Parolin) won twice in 2016, including a Grand Nationals victory, and is set for his second year in the class. 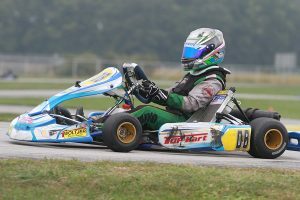 The same for Danny Dyszelski, as the sophomore Cadet level driver aboard a Vemme Kart is looking for his first win in the class. 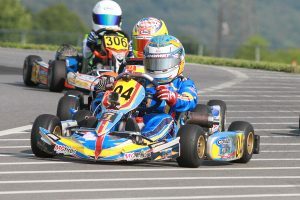 Benjamin Maier place fifth in last year’s standings, and among the many drivers moving over to the Nitro Kart chassis, hoping to give the brand its first victory. 2016 Yamaha Sportsman champion Madison Campeau – the first female champion in WKA Manufacturers Cup Series in a number of years – is moving up to the Junior ranks and thus leaving a title defense on the table. The Adams brothers appear to be the top drivers to battle for the championship, with Garrett finishing third and Logan fourth in last year’s standings. Thomas Schrage (Tony Kart) showed promise and will be among the contenders in 2017. New for 2017 is 4-cycle racing to the Manufacturers Cup Series. Known as a 2-cycle only series, the program has welcomed the popular Briggs & Stratton 206 engine to the class roster. 206 was part of the Winter Cup last year, welcoming 40 drivers in the Senior class utilizing WKA Gold Cup rules at Daytona. Now part of the Manufacturers Cup and Winter Cup programs, the class will utilize Manufacturers Cup chassis rules, including the CIK style bodywork only. Double Daytona winner Corey Towles is set to defend his two victories aboard his Comet Kart Sales Eagle chassis with Day 2 podium finishers Eric Fagan (Keener) and Dustin Demattia (Keener) making a return to Daytona KartWeek. Watch for the large contingent of Margay racers, including Trans Am driver Jordan Bernloehr – a runner-up at the 2015 Rock Island Grand Prix Ignite Shootout. Daytona KartWeek serves as the opening rounds for the WKA Winter Cup program. Set to start its second season, the three event series has added the Vortex Rok Shifter category for Daytona, along with Jacksonville and Ocala. A number of the engines and racers reside in Florida, with a good number of driver anticipated for the three races. SKUSA S2 front-runner Rory Van der Steur (FA Kart) and Abby McLaughlin (Top Kart) are among those entered in Daytona. The weather is scheduled to be perfect. Not as hot as it was a year ago, but temperatures in the 70s, maybe reaching 80 degrees. eKartingNews.com is excited to get the 2017 season going, and it all begins with the WKA Daytona KartWeek!